An arc of buried megaliths that once formed part of the great stone circle at Avebury in Wiltshire has been discovered. A map of Avebury drawn up by William Stukely in the 1720s showed that many of the stones in the south east and north east quadrants of the circle were missing. A survey of these areas by the National Trust has revealed that at least 15 of the megaliths lie buried in the circle itself. 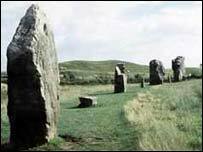 The stones show up clearly on computer images and the National Trust has been able to identify their sizes, the direction in which they are lying and where they fit in the circle. It is now considering using ground-probing radar to create three dimensional images of each of the buried stones and raise them as computer images. Martin Papworth, the National Trust's archaeologist for Wessex, said: "This is a truly exciting find and completes the circle of Avebury. "These stones were erected over 4,500 years ago and the world of archaeology suspected that most of these stones had been demolished and lost forever. "Until now, no-one had realised that some of these stones had survived intact and that they actually lay buried in the earth, next to their original locations. "It is quite likely that they have lain there since the 13th and 14th centuries, pushed over and buried there by the local population who may have seen these pagan symbols as a threat to the established church."